Portland, Oregon — Portland Thorns FC advanced to their second-straight NWSL Championship after defeating their Cascadia rivals, Seattle Reign FC, 2-1 at Providence Park in front of a buzzing audience of 14,179 on Saturday afternoon. In the fourth meeting this season between the two sides, the Thorns and Reign met for just the first time ever in the postseason. The Thorns, familiar to the playoffs and fresh off winning the 2017 NWSL Championship, now get to return to the final stage, but this time on their home turf. The 2018 NWSL Championship will be played next Saturday at Providence Park and the Thorns will play the winner of the North Carolina Courage vs. Chicago Red Stars semifinal game on Tuesday. Saturday afternoon was jam packed with big goals, highlight-worthy saves, controversial calls, yellow cards, and anything one could hope in a rivalry playoff game. Seattle forward Jasymne Spencer put the Reign up front early, but Tobin Heath equalized for the Thorns just before the half. 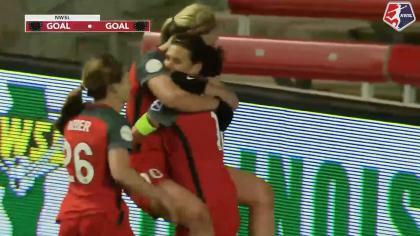 Later, it was Lindsey Horan who headed home the game-winner. In the 29th minute, Spencer put the Reign up 1-0. The Reign came out in the first half hungry for revenge from last week’s disappointing 3-1 loss to Portland, and it was clear that with the return of Allie Long and Megan Rapinoe to their starting lineup, the Reign were going to be a different team on the afternoon. Spencer’s goal blossomed from some combination one-two play between Rapinoe and Jess Fishlock in the final third. Fishlock drew a foul from Thorns defender Emily Sonnett and Rapinoe took a free kick for Seattle in the 28th minute. Sonnett was given a yellow card for the foul. 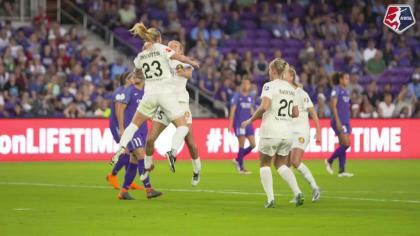 Rapinoe’s free kick was headed to the far post, and Thorns goalkeeper Adrianna Franch made a leaping save to get a piece of the ball, but it kissed the post and bounced into the path of Spencer. Spencer then knocked it near post past Franch to give the visitors an early lead. “We were successful. We did not win, but we were successful,” Andonovski said. Andonovski’s side held the better of the possession on the day at 55.5% to the Thorns 44.5%. The Reign also took 17 shots to the Thorns 12. But, the difference-maker on the day — apart from the goal-scoring finesse of Horan and Heath — was Franch in net. Andonovski tipped his hat to Franch, too. Reign forward Jodie Taylor took an absolute one-time blast from the top of the box, but Franch managed to make a leaping one-handed save and deny another Reign goal. The shot by @Jodes_14. The save by @ADizzle23. Then just minutes later, Long got a shot off from a distance and it landed to the foot of Taylor with her back to the goal. Taylor managed to spin on a dime and crack one far post, but Franch reacted quickly and pounced, making another one-handed save. Franch finished the match with four saves. Her stops in the first half, combined with the Reign lead, lit a fire under the Thorns offensively and, just before the break, a strong transitional attack from Portland led to a Heath finish in the 43rd minute. Heath scored her eighth goal of the season and Horan earned her third assist with the dish. Providence Park was alive come the start of the second half, but quickly chanting turned to boos when what would have been a second goal from Heath on the day was called back as offside. In the 69th minute, Horan, Christine Sinclair and Heath all connected for a textbook play that eventually saw Heath slide one past Reign goalkeeper Lydia Williams. The offside call was controversial as the replay showed that Heath was onside. Horan headed home her 14th goal of the season, and seventh with her head in the 77th minute off of a chip pass from Sinclair. “I am very happy,” Horan said. Sonnett went down with a knee injury late into the game and left the game in the 91st minute. “[She is] hopefully okay, we’ll find out a bit more in the next couple of days,” Parsons updated the media after the game. If you thought Providence Park was alive last Friday and Saturday, just wait until next Saturday’s Championship. “I don’t know if we’re gonna sleep in the next week in anticipation for this,” Parsons said. Match ends, Portland Thorns 2, Seattle Reign 1. Second Half ends, Portland Thorns 2, Seattle Reign 1. Substitution, Portland Thorns. Elizabeth Ball replaces Emily Sonnett. Corner, Portland Thorns. Conceded by Theresa Nielsen. Substitution, Seattle Reign. Elizabeth Addo replaces Jessica Fishlock. Attempt missed. Tobin Heath (Portland Thorns) left footed shot from outside the box is high and wide to the right. Corner, Portland Thorns. Conceded by Beverly Yanez. Attempt missed. Megan Rapinoe (Seattle Reign) header from the centre of the box is close, but misses to the left. Assisted by Megan Oyster with a cross. Substitution, Seattle Reign. Beverly Yanez replaces Jasmyne Spencer. Goal! Portland Thorns 2, Seattle Reign 1. Lindsey Horan (Portland Thorns) header from very close range to the top left corner. Assisted by Christine Sinclair with a through ball. Offside, Portland Thorns. Ana Maria Crnogorcevic tries a through ball, but Caitlin Foord is caught offside. Hand ball by Rumi Utsugi (Seattle Reign). Rumi Utsugi (Seattle Reign) wins a free kick in the attacking half. Corner, Portland Thorns. Conceded by Stephanie Catley. Corner, Seattle Reign. Conceded by Christine Sinclair. Corner, Seattle Reign. Conceded by Adrianna Franch. Attempt missed. Megan Rapinoe (Seattle Reign) right footed shot from outside the box is close, but misses to the right. Corner, Seattle Reign. Conceded by Emily Menges. Emily Menges (Portland Thorns) is shown the yellow card for a bad foul. Jasmyne Spencer (Seattle Reign) wins a free kick on the right wing. Attempt missed. 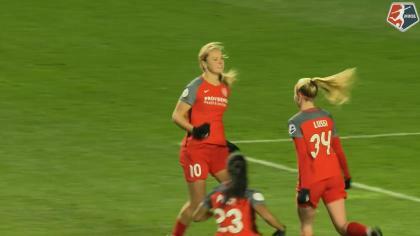 Emily Sonnett (Portland Thorns) header from the centre of the box misses to the left. Assisted by Tobin Heath following a set piece situation. Attempt missed. Emily Sonnett (Portland Thorns) header from the centre of the box misses to the right. Assisted by Tobin Heath following a set piece situation. Second Half begins Portland Thorns 1, Seattle Reign 1. Substitution, Portland Thorns. Ana Maria Crnogorcevic replaces Midge Purce. First Half ends, Portland Thorns 1, Seattle Reign 1. Attempt blocked. Caitlin Foord (Portland Thorns) right footed shot from the right side of the box is blocked. Caitlin Foord (Portland Thorns) wins a free kick in the defensive half. Goal! Portland Thorns 1, Seattle Reign 1. Tobin Heath (Portland Thorns) left footed shot from the centre of the box to the centre of the goal. Assisted by Lindsey Horan. Lydia Williams (Seattle Reign) wins a free kick in the defensive half. Attempt saved. Megan Rapinoe (Seattle Reign) with an attempt from very close range is saved in the bottom left corner. Adrianna Franch (Portland Thorns) wins a free kick in the defensive half. Attempt saved. Jodie Taylor (Seattle Reign) left footed shot from the centre of the box is saved in the bottom left corner. Assisted by Allie Long. Attempt missed. Allie Long (Seattle Reign) right footed shot from outside the box misses to the left. Assisted by Jasmyne Spencer. Attempt missed. Lindsey Horan (Portland Thorns) header from very close range misses to the right. Assisted by Meghan Klingenberg with a cross. Attempt missed. Megan Rapinoe (Seattle Reign) right footed shot from the centre of the box is close, but misses to the right following a corner. Attempt saved. Jodie Taylor (Seattle Reign) right footed shot from outside the box is saved in the top centre of the goal. Corner, Seattle Reign. Conceded by Ellie Carpenter. Attempt saved. Allie Long (Seattle Reign) right footed shot from outside the box is saved in the top centre of the goal. Attempt blocked. Jodie Taylor (Seattle Reign) left footed shot from the centre of the box is blocked. Assisted by Megan Rapinoe. Goal! Portland Thorns 0, Seattle Reign 1. Jasmyne Spencer (Seattle Reign) right footed shot from very close range to the bottom right corner following a set piece situation. Megan Rapinoe (Seattle Reign) hits the bar with a right footed shot from a difficult angle and long range on the left from a direct free kick. Jessica Fishlock (Seattle Reign) wins a free kick on the left wing. Attempt blocked. Jessica Fishlock (Seattle Reign) left footed shot from outside the box is blocked. Assisted by Jodie Taylor with a headed pass. Attempt blocked. Tobin Heath (Portland Thorns) left footed shot from the centre of the box is blocked. Attempt saved. Midge Purce (Portland Thorns) right footed shot from the centre of the box is saved in the top centre of the goal. Attempt saved. Caitlin Foord (Portland Thorns) right footed shot from the right side of the six yard box is saved in the centre of the goal. Corner, Portland Thorns. Conceded by Megan Oyster. Attempt blocked. Tobin Heath (Portland Thorns) left footed shot from the centre of the box is blocked. Assisted by Midge Purce with a headed pass. Attempt blocked. Megan Rapinoe (Seattle Reign) left footed shot from outside the box is blocked. Assisted by Jasmyne Spencer. Corner, Seattle Reign. Conceded by Lindsey Horan. Attempt saved. Christine Sinclair (Portland Thorns) right footed shot from the left side of the box is saved in the centre of the goal. Assisted by Lindsey Horan. Corner, Seattle Reign. Conceded by Midge Purce.